The welcoming open air garden terrace at The Bloomsbury Club is semi-covered and heated for year-round use in any weather, despite being outside, which is how it complies with smoking laws. Once Ireland’s largest hotel group, Jurys Doyle Hotels spent the last decade unloading their more pedestrian holdings and rebranding their luxury segment under a new name: The Doyle Collection. Domestic travelers may be familiar with Doyle’s Dupont Circle Hotel in Washington, D.C., but across the pond, the group has been busy with a multi-million-dollar reimagining of The Bloomsbury Hotel in London, which reopened in phases over the past two years. 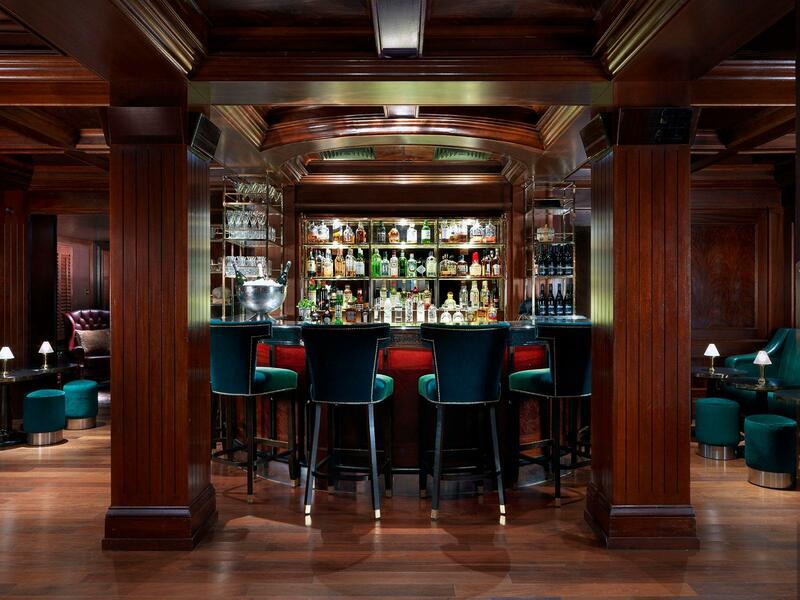 Located in the city’s West End theater district—and complete with a popular new cigar spot—the hotel occupies a historically listed neo-Georgian mansion designed in the 1930s by Sir Edwin Lutyens, often considered to be the greatest British architect of his time. The name alludes to the Bloomsbury Set, a very influential group of English writers and thinkers who lived it up while intellectualizing in this London neighborhood in the 1920s, much like Ernest Hemingway and James Joyce were doing across the Channel in Paris. The group included Virginia Woolf, E.M. Forster and John Maynard Keynes, and as a result the boutique hotel has an artsy literary theme, with a comfortable lobby library and lots of books in guest rooms. But the highlight for smokers is The Bloomsbury Club Bar, which plays on the underlying motif with a Roaring Twenties Jazz Age feel, including intimate live music on weekend nights. Despite its name, the public bar is not one of London’s many private clubs, though it has that feel and often require reservations—easy to come by if you are staying there. It is located in the basement of the hotel and has both an internal guest entrance and separate direct staircase entry from the street outside. A deep whiskey list features lots of Scotch, Irish, and Japanese whiskies, and especially by London standards, a very lengthy American selection. 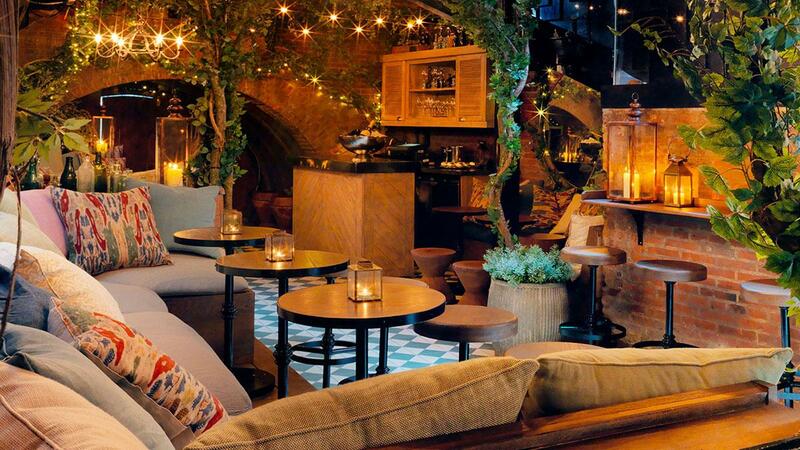 The Club Bar is divided in half, indoors and out, and the welcoming ivy strewn open air garden terrace is semi-covered and heated for year-round use in any weather, despite being outside, which is how it complies with smoking laws. Inside has a pronounced jazz club feel with leather armchairs flanking low theater-style tables for two, velvet ottomans as seats, lots of heavy curtains, and eclectic period décor such as framed travel and cruise line posters and antique leather boxing gloves. A trio of white tuxedoed bartenders shake and strain classic cocktails and house specialties named for figures such as Woolf and Keynes behind a small peninsula shaped bar in the middle of the action. Drinks, food (clever bar snack twists on English comfort food classics) and service are all topnotch—cleverly mounted small mirrors in key locations let bartenders see whether guests otherwise blocked from view by structural pillars need a drink, so they can send over a waitress. A deep whiskey list features lots of Scotch, Irish, and Japanese whiskies, and especially by London standards, a very lengthy American selection. Rare bottles are displayed in full view but under lock and key in a glass doored whiskey library. The outdoor bar is much more laid back, with drink ledges around the space and many guests standing as if at a garden party. 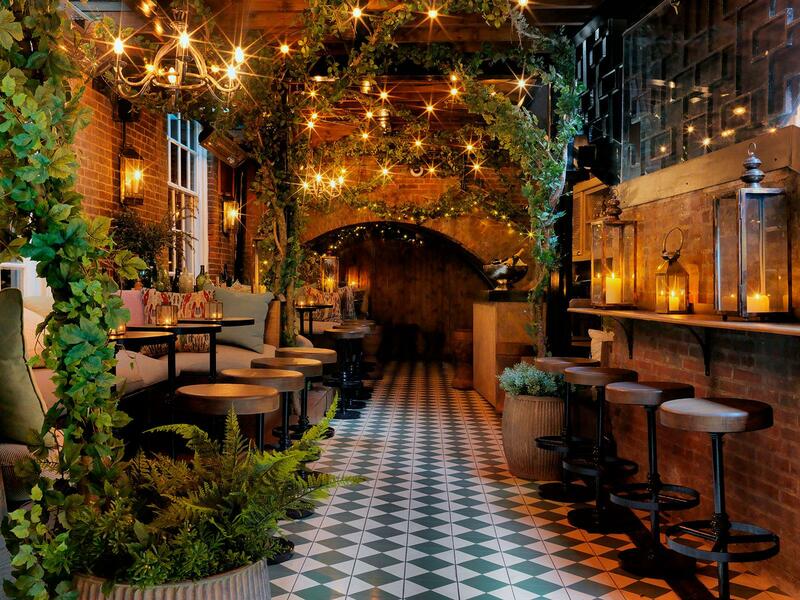 The trellised open-air roof overhead is wrapped in boughs and Christmas lights, adding to the festive flair, though the below ground hidden “grotto” feel gives it an escapist vibe, especially in the heart of one of the world’s most dynamic cities. The outdoor bar is much more laid back, with drink ledges around the space and many guests standing as if at a garden party. The cigar menu is concise but high quality and varied in size, with choices from half coronas to wide Churchills. The brand selection includes Cohiba, Hoyo de Monterrey, H. Upmann, Partagás, Montecristo and Romeo y Julieta, all with suggested drink pairings. All the cigars are authentic Cubans imported by Hunters and Frankau, the U.K.’s distributor of Habanos S.A. The hotel is in a great tourism location, just two blocks from the British Museum, and within easy walking distance of Covent Garden, Oxford Street, the Royal Opera House and the chic shops and bespoke tailors of Mayfair. Open Monday through Saturday: 5 p.m. to 1 a.m.
Sunday: 5 p.m. to 12 a.m.